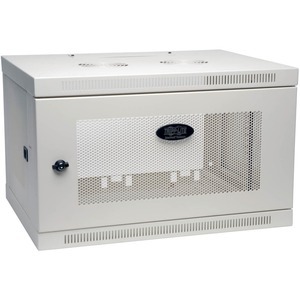 The SRW6UW is a white 6U Wall-Mount Rack Enclosure Cabinet designed to integrate wall-mounting, easy equipment access, and cable management in IT network applications with limited floor space. Ventilated front door and side panels allow generous airflow to keep equipment operating safely. 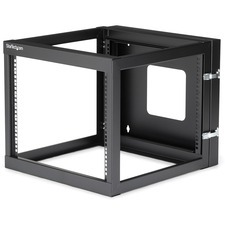 Adjustable front mounting rails have both square mounting holes (default position) and tapped holes to accommodate up to 6U of standard 19" rackmount equipment. Supports up to 200 lbs of equipment. A sturdy wall-mount bracket allows the cabinet to quickly be hung on the wall. The SRW6UW comes with a 5-year product warranty.